The Alaska Federation of Nations (AFN) Convention is the largest representative annual gathering in the United States of any Native peoples. 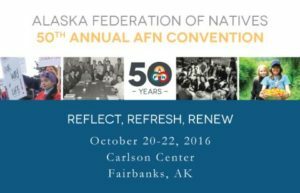 This year marks the 50th Annual AFN Convention taking place October 20 through the 22 at the Carlson Center in Fairbanks, Alaska. Each year, the AFN Convention draws between 4,000–5,000 attendees. The proceedings are broadcast live statewide via television and radio and webcast to 70 countries worldwide. In addition to the memorable keynote speeches, the expert panels and special reports, the Convention features several evenings of cultural performances known as Quyana Alaska. Native dance and music groups from across the state perform for a large and appreciative audiences at the event and watching on TV and the Internet. Delegates are elected on a population formula of one representative per twenty-five Native residents in the area and delegate participation rates at the annual convention typically exceed 95 percent. Policy guidelines and advocacy statements are set by the dozens of resolutions passed by voting delegates at the Convention. The AFN Convention is also known for its popular Alaska Native Customary Art Show, renowned as one of the best places to find Alaska Native and Native American artwork.